Ok, so technically we aren’t actually, but in a few days time we will be, just for a little while. Amy, Ron and I are off to London to see Carol and Stew get married on Australia Day. We are going to be spending time with my parents who are meeting us there from South Africa and we will be catching up with as many friends as we can see in two short weeks. Its going to be very strange being back in London and I am sure will be just as strange being back here in three weeks. Please don’t share your opinions on travelling with a toddler, trust me, we know our Amy and we know its going to be interesting, very in-ter-est-ing! But by the very nature of our families and our lives we were always going to travel and having children wasn’t going to stop that. I might have a completely different opinion after this trip, but for now I am holding strongly onto my belief that entertaining a toddler at 30,000ft can’t be that hard, now can it? I will do my best to post from London when I get a chance, but in the meantime, I apologise for the break in transmission! Stay tuned for many exciting adventures and stories when we return! 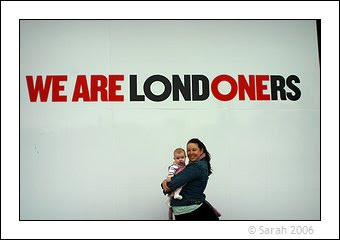 January 23, 2008 | Filed under Amy, Family life, Holiday and tagged with England, travel. Have fun in London. We visited a few Novembers ago and instantly fell in love with the city…and that was in chilly November.